Johor is a state with countless treasures to explore. Visitors will discover the wonderful culture and heritage, from the lushes green forest to the picturesque view of mountain and waterfalls. There are also plenty of mouth-watering foods can be found in Johor as well. The Assam Pedas Fish Head dish is available at Sutera Village near Sutera Mall in Johor Bahru. The fish head is cooked in assam pedas sauce which is made with various ingredients like tomatoes, onions, lady’s fingers, torch ginger flower, curry leaves and spices. The taste is sour and spicy which is very appetizing and great when savor together with rice. 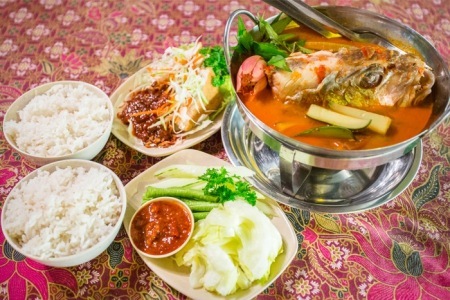 Other places to try out the same dish are at Restoran Ikan Asam Pedas in Kluang, Coco Garden Asam Fish and Merlin Restaurant both located in Muar. The beef brisket noodle soup is a bowl of tasty kuey teow (flat noodle) with chunks of fresh beef meat, stomach, tendons and garnished with sprinkles of chopped preserved cabbages and spring onions. It is a mouth-watering noodle soup loved by many locals as well as visitors. The soup is boiled with herbal together with the beef bones for the aroma and luscious taste. You may try it out at Restaurant Tangkak Beef Noodles at Jalan Solok, Tangkak. Other popular spots for beef noodles are Tin & Tin (Cathay) Beef Kuey Teow stall in Restoran Shang Ji located at Jalan Lumba Kuda and Ah Yong Beef Noodles at Restoran Yong Mui located off Jalan Lumba Kuda, Johor Bahru. Braised duck is cook in the herbal braising sauce. The meat is braised till very tender and juicy with light brownish color absorbed from the sauce. It has a very aromatic smell and is best served with rice. Some restaurants do braised pork as well. Besides braised duck or pork, there are also braised eggs, pig’s ears and other inner parts which taste very good. All these can be found at Skudai Duck Mee at Taman Sri Skudai and 59 Kway Teow Kia in Kee Kim Huat coffee shop located at Taman Sri Tebrau. The chicken rice that worth a try here is the kampung chicken rice, meaning the farm chicken where the meat are more tender and are nicer to eat. The chicken is steam till tender and juicy with some gelatinous jelly like between the meats. It is very nice when served hot with rice and perfectly delicious when dip into the ground chili and ginger sauce. You may head to Ah Lee Kampung Chicken Rice at Taman Sri Tebrau, Restoran Swee Kee Hainan Chicken Rice at Taman Bintang, Senai or Chang Man Restaurant at Taman Nusa Bestari, Skudai to have a taste. Seafood porridge is a bowl of porridge cooked with the scrumptious and naturally sweet seafood broth. The porridge comes with clams, slices of grouper, minced pork, shrimps, fish balls and a meaty crab. With so many different seafood cooked together, there is no artificial flavouring needed. You can get this at either Matang Seafood View Restaurant at Taman Gaya, Ulu Tiram or Pac Corner along Jalan Kukup, Pontian. Nasi Briyani is a rice-based dish cook together with spices, chilies, tomatoes, ginger, almonds, turmeric, lemon grass, garlic and the choice of chicken, mutton or fish. The aroma of Nasi Briyani is mild and refreshing to the taste bud. The meat, normally mutton is covered in rich and flavourful gravy. Visitors can taste it at Jitterbug Café at Jalan Masai Jaya 1, Plentong, Masai. There is a Chinese version of Nasi Briyani with curry chicken which is very popular that worth a try, visitors can try it at the Bus Station Nasi Briyani located at Jalan Jenang, Batu Pahat. Laksa Johor is a unique dish created in Johor. It was said that once the Sultan Johor visited Europe and fell in love with spaghetti. When he returned to Johor, he asked the chef to combine the traditional laksa gravy with spaghetti hence the Laksa Johor is made. The laksa gravy is made from many herbs and spices together with the fish meats. Visitors may visit these places for a taste, Al Ansar Cafe at Jalan Permas 5/16, Restoran Bumbu Asli at Jalan Kolam Ayer and Dann’s Cafe at Jalan Sagu, Taman Daya.